Spartan Nation, April 13th is the first annual SPARTANS WILL. POWER, a Global Day of Service! On that day Spartans around the world will be focused on making a positive difference in their communities. Whether you’re joining forces with your local alumni club or tackling something special individually, your Alumni Career & Business Services team would love to hear your plans for the day. To inspire your remarks, Dave & Lisa have a mini-service project in mind to kick things off. Our Girl Scout cookie order arrived. We need Spartan Nation to save us from the calories of 4 delicious boxes of joy we were convinced we needed by a talented marketing agent in brown. Individuals who share their plans for April 13th in the comment area of this blog post will be included in a drawing for a box of Girl Scout cookies, a SPARTANS WILL. 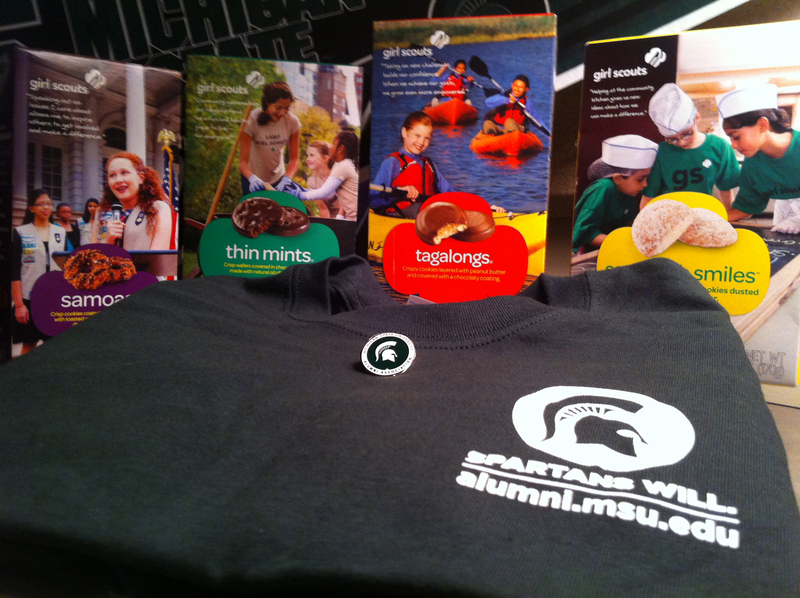 t-shirt and an MSU alumni lapel pin. Four lucky winners will be randomly selected from comments logged by 9:00 a.m. EST on March 29th. To learn more about the Spartan Global Day of Service, check out the following video. We also encourage you to follow updates at serviceday.msu.edu. Spartans in Broward County Florida will be cleaning the beach around Hollywood. It should be a fun and tan day! 🙂 I would happily wear a Spartan shirt. There is a lot of tourism around this area and our beaches should be looking great all the time . Spartans in Eaton County will be cleaning up a local church property. Kalamazoo Alumni are working at Pretty Lake Camp- a camp for disadvantaged children. SPARTANS WILL! Spartans in Milwaukee will be serving brunch at the Ronald McDonald House. We’re really excited about it!